Christopher Robin grows up but still has some important lessons to learn in the charming Christopher Robin (Disney; 2018). 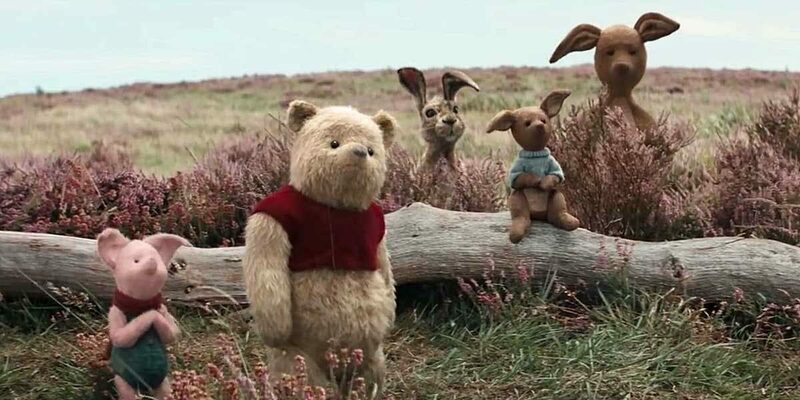 Disney has reinvented its venerable Winnie the Pooh franchise once again, this time turning the stuffed animals from the A.A. Milne’s Hundred Acre Wood into 3D computer generated characters that (somehow) co-exist in the human world. 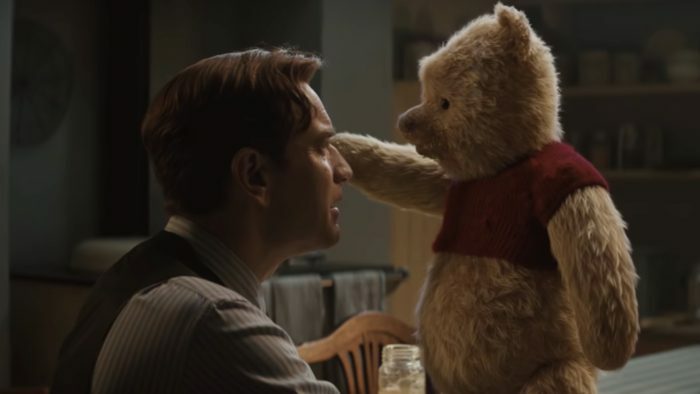 The film answers a couple of interesting questions in the process—what happens to Winnie the Pooh, Piglet, Eeyore, et al, when Christopher Robin grows up, and what if Christopher Robin loses his way as an adult? 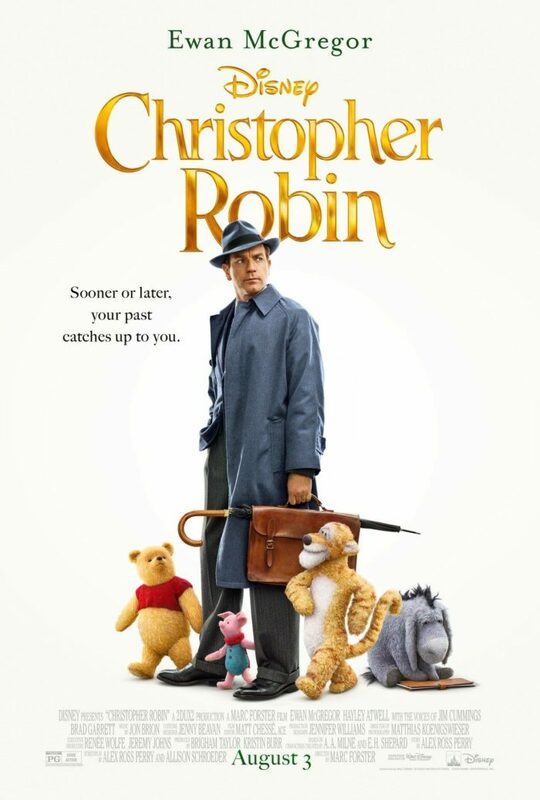 Set in England, Christopher Robin is now a hardworking war veteran employed by a luggage company in London. His job is demanding and stressful and it pulls him away from spending more time with his wife and daughter. Adhering to narrative rules that would be home in any Narnia book, Winnie the Pooh is able to find his way to London and quietly and gently begins to set things straight. Ewan McGregor does a great job playing the war-torn and world-weary adult Christopher Robin. The lovely and talented (and underused in this film) Hayley Atwell plays his wife Evelyn, and Bronte Carmichael plays their daughter Madeline, who is the character suffering the most in the film with her dad lost in the business world and emotionally MIA at home. Voice actor Jim Cummings is back in the role as both Winnie the Pooh and Tigger. Brad Garrett expertly steps into the role of Eeyore. The rest of the cast is excellent, too. This gentle, deliberate film never takes itself too seriously or delivers its message with a heavy hand or a zany punch. Instead, director Marc Forester uses a more old fashioned tone which some might view as slow, but I found it be refreshing and endearing. So much so, that this film will probably appeal more to adults than children. Basically, it just made me want to hug all of these photo-realistic CG stuffed animals and return to the innocence of childhood—a place full of clarity, goodness, and wonder. Disney fans should also be happy with the new songs written by Richard Sherman, the surviving member of the great Sherman Brothers songwriting duo who wrote the classic songs for Disney’s original Winnie the Pooh shorts. Make sure to stay through the end credits. As an added bonus, here’s the cute one-sheet poster from the U.S. release of the film.